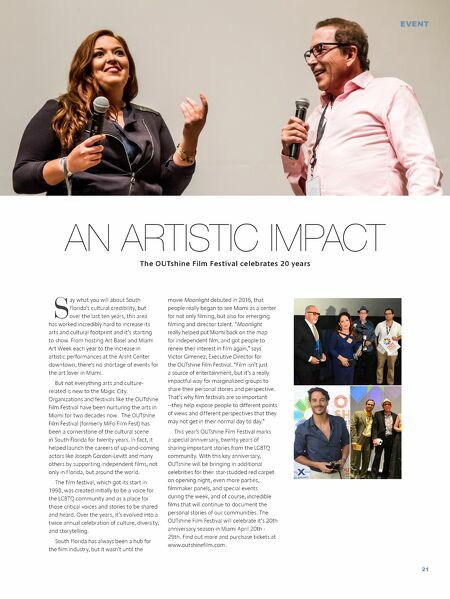 An Artistic Impact The OUTshine Film Festival celebrates 20 years Say what you will about South Florida's cultural credibility, but over the last ten years, this area has worked incredibly hard to increase its arts and cultural footprint and it's starting to show. From hosting Art Basel and Miami Art Week each year to the increase in artistic performances at the Arsht Center downtown, there's no shortage of events for the art lover in Miami. But not everything arts and culture-related is new to the Magic City. Organizations and festivals like the OUTshine Film Festival have been nurturing the arts in Miami for two decades now. The OUTshine Film Festival (formerly MiFo Film Fest) has been a cornerstone of the cultural scene in South Florida for twenty years. In fact, it helped launch the careers of up-and-coming actors like Joseph Gordon-Levitt and many others by supporting independent films, not only in Florida, but around the world. The film festival, which got its start in 1998, was created initially to be a voice for the LGBTQ community and as a place for those critical voices and stories to be shared and heard. Over the years, it's evolved into a twice annual celebration of culture, diversity, and storytelling. South Florida has always been a hub for the film industry, but it wasn't until the movie Moonlight debuted in 2016, that people really began to see Miami as a center for not only filming, but also for emerging filming and director talent. "Moonlight really helped put Miami back on the map for independent film, and got people to renew their interest in film again," says Victor Gimenez, Executive Director for the OUTshine Film Festival. "Film isn't just a source of entertainment, but it's a really impactful way for marginalized groups to share their personal stories and perspective. That's why film festivals are so important --they help expose people to different points of views and different perspectives that they may not get in their normal day to day." This year's OUTshine Film Festival marks a special anniversary, twenty years of sharing important stories from the LGBTQ community. With this key anniversary, OUTshine will be bringing in additional celebrities for their star-studded red carpet on opening night, even more parties, filmmaker panels, and special events during the week, and of course, incredible films that will continue to document the personal stories of our communities. The OUTshine Film Festival will celebrate it's 20th anniversary season in Miami April 20th - 29th. Find out more and purchase tickets at www.outshinefilm.com.